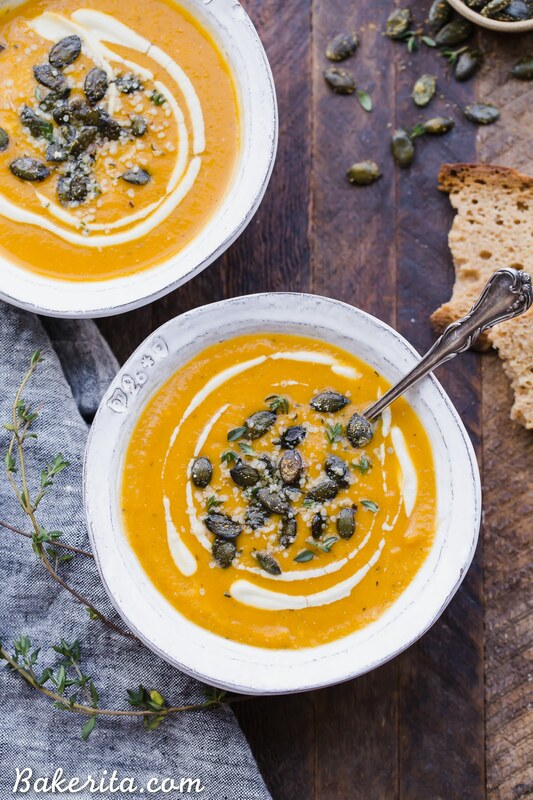 This Butternut Squash Soup is smooth, brightly flavored, and swirled with an easy cashew cream. 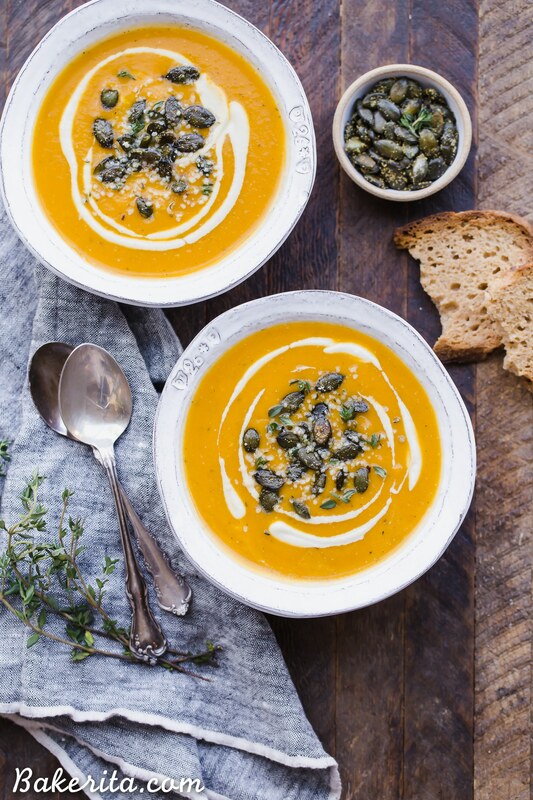 It’s topped off with crunchy spiced pumpkin seeds. 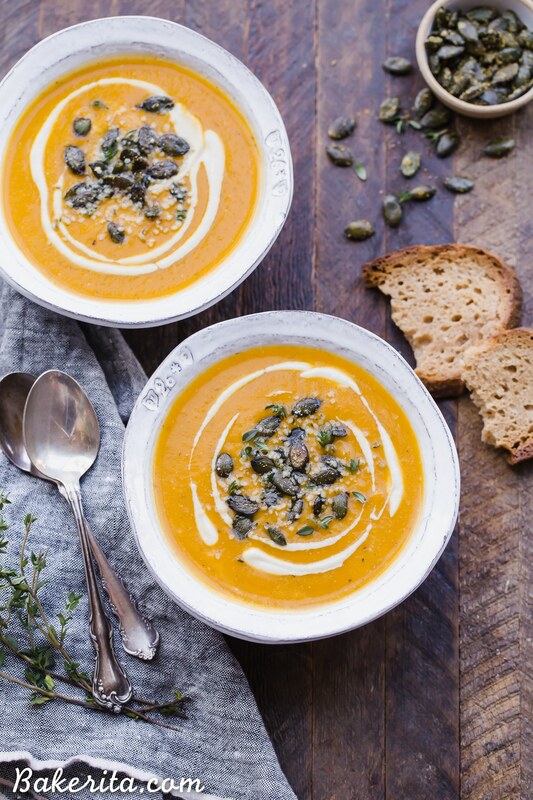 This paleo and vegan soup is perfect for chilly days and best served with some crusty gluten-free bread! Thanks to Sunfood for sponsoring this post. I’ve been all about the cozy soups and meals lately, despite San Diego weather never cooperating with how chilly I want it to be in November. We’re still dealing with mid-70s (which is not helping with all the fires we’re seeing) and lots of sunshine. Case in point: I’m wearing shorts as I write this. Still, I’ve been cranking my air conditioner to keep my apartment chilly so I can still indulge in allll the cozy, warm foods. I’ve been making all sorts of soups and chili and curry to make myself feel like it’s winter. I’m sure some of you who are dealing with the snow are rolling your eyes at me right now, but we always want what we don’t have, right? And I’ve gotten super sick of sunny and 75 degrees all year round. Although nice, it certainly gets old after a while. So I’ve been indulging my cozy side in my air conditioning by making myself all the warm foods, like this Butternut Squash Soup. It’s simple to make and I didn’t go crazy with too many herbs or spices, so the butternut squash flavor shines through. Let’s make Butternut Squash Soup! This soup is loaded with veggies and just a little bit of thyme to add a little earthy herbaceousness. Best of all, it comes together in just about 30 minutes, give or take a little time depending on how small you cut your butternut squash chunks. After everything is cooked, it’s blended until silky smooth with an immersion blender. You can put it in a regular blender if you don’t have an immersion blender, but I like not having to wash the blender – one-pot meal, baby!!! Because I kept it simple, you can adjust for your tastes. I don’t like adding cinnamon and nutmeg to butternut squash soup, because I don’t want it to taste like pumpkin pie. But! I know some people are into that, so feel free to add in a little bit of each if that’s your jam. Just don’t skip the cashew cream swirled in on top, or the spiced pumpkin seeds, because those are GAME CHANGERS! I use Sunfood’s super high-quality raw cashews (my fave) to make a super simple cashew cream. It’s made with just soaked cashews, water, lemon juice, and salt. It adds such a lush creaminess to the soup. This Butternut Squash Soup is smooth, brightly flavored, and swirled with an easy cashew cream. 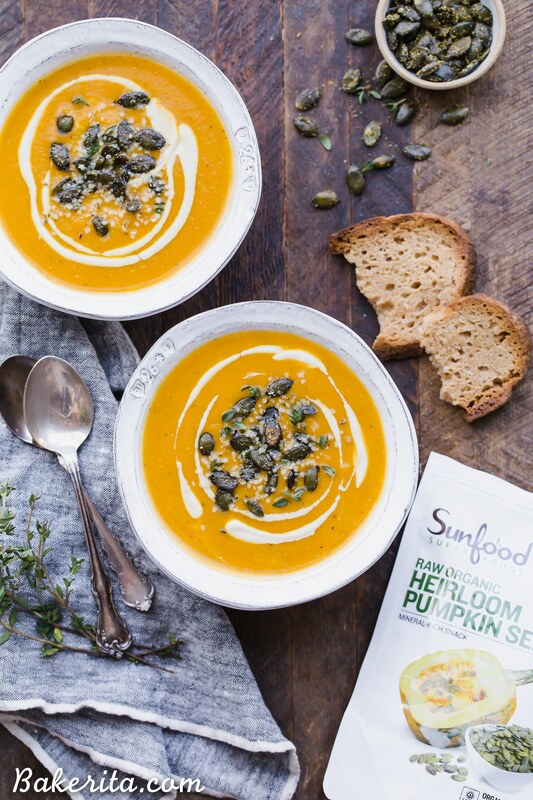 It's topped off with crunchy spiced pumpkin seeds. 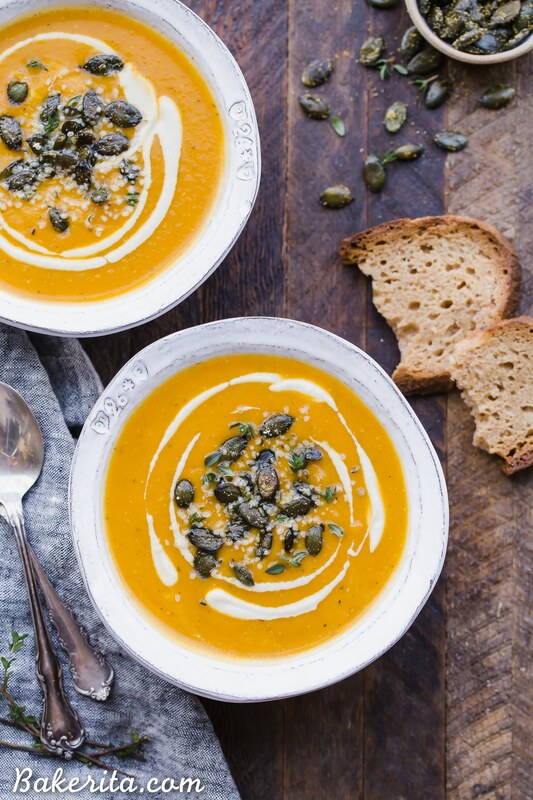 This paleo and vegan soup is perfect for chilly days and best served with some crusty gluten-free bread! Heat the oil in a soup pot over medium heat. Once hot, add the onion and saute until translucent, about 5 minutes. Add in the celery, carrot, and garlic and saute for about 2 minutes or so, until the garlic is fragrant. Add the butternut squash, vegetable broth, and thyme. Cover and bring to a boil. Turn down the heat to a simmer and let cook for 20 minutes, or until the butternut squash and other veggies are tender. Use an immersion blender (or transfer to a regular blender - if you do this you may have to do multiple batches) to blend until completely smooth. Add salt & pepper to taste, and then stir in the almond milk. Serve with cashew cream, pumpkin seeds, fresh thyme springs, and/or hemp seeds. Enjoy! Combine the soaked cashews, water, lemon juice, and salt in a high-speed blender and blend until completely smooth. Add more liquid if you want it any thinner. Serve drizzled over the soup. Store any leftovers in a jar in the fridge. Heat a small saute pan over medium heat. Add the pumpkin seeds and oil and toast until lightly golden brown. Add the spices and toss to coat them all. Use as garnish for the soup. Thanks so much Rita, hope you had a great Thanksgiving as well and hope you love the soup!